&#8220Activist New York,&#8221 the inaugural exhibition in the Museum of the City of New York’s new Puffin Foundation Gallery, will examine the ways in which ordinary New Yorkers have advocated, agitated, and exercised their power to shape the city’s &#8211 and the nation’s &#8211 future. Centuries of activist efforts, representing the full spectrum of political ideologies, will be illuminated through a series of installations featuring 14 New York movements ranging from the mid-17th century to today. The exhibition will feature historic artifacts and images from the museum’s collection as well as pieces on loan from other collections, along with interactive elements that enable visitors to explore and express their own views. For the first three weeks of the exhibition attendees will have a chance to view the original “Flushing Remonstrance,” the 1657 landmark document protesting restrictions against Quakers in New Amsterdam. &#8220Activist New York&#8221 begins and ends with questions of religious freedom, from the struggle for religious tolerance in Dutch New Netherland, to today’s debate over a Muslim Cultural Center near Ground Zero. In between, the exhibition examines a wide range of social movements that transformed laws and assumptions regarding race, gender, class, sexuality, economic justice, and other issues. The Puffin Foundation Gallery is situated in a newly renovated and climate-controlled 2000 square foot south gallery on the Museum’s second floor, and named for the foundation that has supported the gallery with a gift of $3.25 million. The exhibition features the Flushing Remonstrance, one of the earliest arguments for religious liberty and tolerance in American history. This section explores efforts to prohibit or limit immigration and contain its impact on 19 th -century New York. Nativists fought to curtail the largely Catholic immigrant community’s access to citizenship, the vote, and public office. The section also illustrates the ways Catholic New Yorkers combated nativism by establishing their own independent institutions to support their community. While New York City was a center of the abolitionist movement, it was also home to many people who sided with the Southern slave owners. This conflict was dramatically revealed in the Draft Riots of July 1863, where the issues of class and race came to a head in a harrowing, violent confrontation. The exhibition chronicles the efforts of both sides of the debate. In the early 20 th century,New York became the epicenter for organizational activity of the national woman suffrage movement, with suffragists pioneering new methods of behind-the-scenes organizing and media-savvy publicity. The installation also documents the movement against woman suffrage through anti-suffrage images and messages published by aNew York lithograph firm. Immigrants in New York at the turn of the 20th century faced overcrowding, illness, and poverty. This section of the exhibition shows how a new type of agent for change—the settlement house worker—combated those conditions by moving into slum neighborhoods to provide instructions in parenting, health, and citizenship. 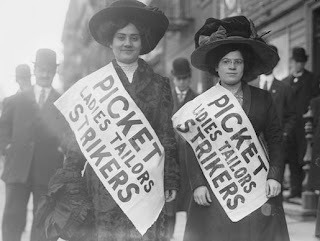 This installation examines the events that led to reform and improvement of deplorable workplace conditions, including the 1909 &#8220Uprising of the 20,000,&#8221 an industry-wide strike by workers affiliated with the fledgling International Ladies’ Garment Workers Union, and the 1911 Triangle Waist factory fire tragedy. 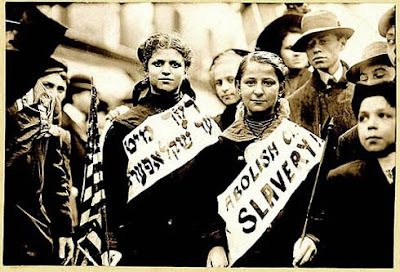 This movement looks at the politically engaged New Yorktheater groups that used their art to confront Depression-era poverty, labor exploitation, political corruption, racial tension, and the rise of Fascism and Nazism in Europe. 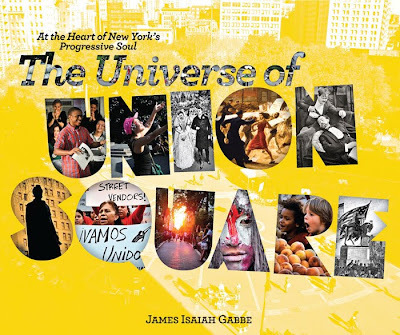 This installation revealsNew York City’s role in the early Civil Rights struggle of the post-World War II era, from the “Boycott Jim Crow” and anti-lynching movements through the emergence of CORE and SNCC, to the Black Power era of the mid-1960s. This segment of the exhibition looks at groups, such as “Parents and Taxpayers,” that were unhappy with a leftward drift in the city and blamed it for an increase in disorder, crime, and the swelling municipal budget. Many joined a new third party, the Conservative Party of New York, formed in 1962. This case study shows how the loss of some of the city’s greatest cultural and architectural landmarks fed the efforts of the early historic preservation movement and eventually led to the creation of New York’s groundbreaking Landmarks Preservation Law. This installation shows how the Stonewall Riots galvanized the modern gay rights movement in New York and led to the creation of Gay Men’s Health Crisis, ACT UP, and other organizations. The installation brings the story up to date with the successful campaign to secure the legalization of gay marriages in New York State. The South Bronx became an international icon of urban blight in the 1970s. This section of the exhibition examines grassroots advocacy groups, community organizations, and church congregations that took ownership of the rebuilding of their neighborhoods into livable, affordable communities. Amid concerns about ecology, traffic congestion, and pollution, pioneering activists lobbied for changes in the traffic laws. Today, as part of the Bloomberg administration PlaNYC’s effort to build a greener, more sustainable city, bike lanes proliferate, as does agitation against for and against them, as this installation documents. This section provides a detailed exploration of the controversy over the construction of an Islamic cultural center near Ground Zero in Lower Manhattan, which is reminiscent of the long and turbulent saga of activism surrounding issues of religious expression in New York City. Interactive elements throughout the exhibition provide opportunities to dig more deeply and bring the historic stories up to date. A series of touch screens present a timeline of the history of activism in the city, with more than two hundred examples ranging from slave revolts of the 18th century to the Newsboys’ Strike of 1899 to the woman behind the movement that led to New York’s 1978 “pooper scooper” law. Additional kiosks with touch screens invite visitors to explore the work of contemporary activist groups and send email messages to these groups expressing the visitors’ views on current activism. In addition, members of the general public may submit photographs of contemporary activist in the city to a photo blog housed on the Museum’s website (www.mcny.org) and carried live in the Puffin Foundation Gallery. &#8220Activist New York&#8221 has been organized by an exhibition team led by Sarah M. Henry, the Museum’s Deputy Director and Chief Curator. Steven H. Jaffe served as guest curator, and Christina Ziegler-McPherson as associate guest curator. The exhibition team was aided by the Puffin Foundation Gallery Advisory Committee, chaired by Peter G. Carroll, Executive Director, Abraham Lincoln Brigade Archives, and comprising scholars and activists Esther Cohen, Joshua Freeman, Victor Navasky, Bruno Quinson, Christopher Rhomberg, Tom Roderick, and Perry, Gladys, and Neal Rosenstein.